The Apollo Nights Summer Series is a new concert experience for the capital. Over one week in July 2019 at London’s Eventim Apollo, legendary artists will take to the stage, as the Apollo’s newly restored Art Deco interior is celebrated as the stalls area is transformed into an intimate dining experience for a truly spectacular evening, marrying the delights of the best in music and food. The first artists announced are Burt Bacharach and Joss Stone together in concert on 16th and 17th July, George Benson on 18th and 19th July and Marc Almond on 20th July. A dining experience by one of the UK’s most exciting chefs – Bryn Williams – will take the diners through a culinary treat ahead of the show itself. Bryn is an acclaimed British chef-entrepreneur who brings flair and imagination to his classically British menus. Hailing from Denbigh in North Wales, Bryn learnt to appreciate food and its origins from an early age and has come to work in some of the most prestigious kitchens in London. Having served under Marco Pierre White at the Criterion, and subsequently Michel Roux at Le Gavroche, Bryn is currently Chef Patron of Odette’s and Bryn Williams at Porth Eirias and Executive Chef at Bryn Williams at Somerset House. Situated on the transformed stalls floor, dining experience ticket holders will be up close to the stage and the artists. Expect a modern British dining experience, with a strong focus on sustainability, seasonality and provenance. Opening the inaugural Apollo Nights Summer Series 2019 will be two nights with Burt Bacharach and Joss Stone (Tuesday 16th and Wednesday 17th July). A partnership that began in 2015, the Grammy award winning songwriter and one of the UK’s most remarkable and distinctive singers will join forces with an orchestra to present songs from his vast cannon of repertoire. When they first performed together at the Royal Festival Hall, the Evening Standard commented how “Stone’s knockout voice was tough and tender…sassy… and serene” as they awarded them a 5 star review. For this special one off concert, expect to hear some of his most unforgettable hits including I'll Never Fall In Love Again, The Look Of Love, I Say A Little Prayer, Walk On By, Anyone Who Had A Heart, Raindrops Keep Fallin' On My Head, (They Long To Be) Close To You, Do You Know the Way to San Jose, In Between The Heartaches, This Guys in Love With You and many many more! 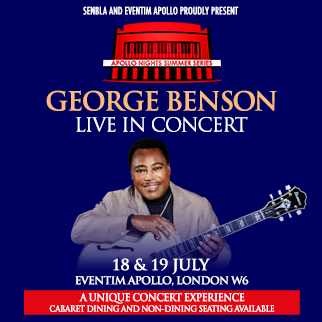 Legendary ten-time Grammy Award and NEA Jazz Master winner George Benson is set to dazzle the audience over two nights – Thursday 18th and Friday 19th July – as he is joined by his all-American band. Benson’s career covers five decades, with more than 30 recordings under his belt. The concert will celebrate his greatest hits from his impressive back catalogue – which includes such classics as Give Me The Night, Lady Love Me (One More Time), Turn Your Love Around, Love X Love, Never Give Up On A Good Thing and In Your Eyes. Capping off a great week of music will be the inimitable Marc Almond. Performing on Saturday 20th July, Almond will take the audience on a journey through his hits as well as his favourite burlesque and cabaret songs. One of the most gifted vocal talents the UK has ever produced, Almond has enjoyed a celebrated career as an artist selling over 35 million records worldwide. For this special show, he will be joined by Europe’s most renowned burlesque dancer, Immodesty Blaize. As Britain’s biggest burlesque star with her infamous hourglass shape, Immodesty recalls the lost art of bombshell glamour on stage; she is a modern-day embodiment of a Fellini muse. Winning several international titles including Reigning Queen of Burlesque in Las Vegas, Immodesty is unanimously credited with bringing burlesque to the mainstream in Europe over the last 2 decades, re-introducing it into West End theatre, and onto prime-time TV.